Two of giant panda came to Ueno zoo at Tokyo last week. We can't see them now. However, especially people who live in Tokyo are waiting for coming to Japan. Some giant panda had been kept in Ueno zoo, however, people couldn't have seen cute panda in Tokyo. Giant panda was one of popular animals in Zoo. The motion of panda is very cute. It's like stuffed doll. I haven't gone to zoo for a long time. I want to see this panda at Ueno zoo. There is a Japanese word about panda. It is kyakuyose panda. 客寄せパンダ This means person who is very popular and can get audience on show or performance. And cute character, tarepanda たれぱんだ is famous and It became very popular about a decade ago. The name isn't announced now. But we can see cute panda in near future. I'm looking forward to seeing them. When I go to a trip abroad, there are some Japanese foods that I want to. Miso soup, natto (Fermented beans) Udon or Ramen, etc. These are difficult to bring in foreign countries. (However, we might eat Japanese foods in some countries now...) But I definitely bring a Japanese snack for trip. It is senbei. Senbei is most useful food to bring because they are so light. 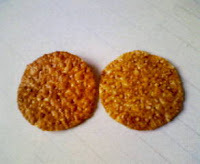 Basic senbei's taste is soy sauce and the shape is circle. It is so simple taste. There are a lot of kinds of senbei. Soy sauce taste wrapped with sea weed (Nori), salt, cheese, sugar... I love all kinds of senbei. Senbei is one of popular souvenirs for tourists who come to Japan. When you visit Japan, please try eating it.